Hey everyone! This is Brian from This Cookin’ Dad. With summer soon approaching, we’ll be scrambling for easy recipes that we can take with us to backyard parties and potlucks. 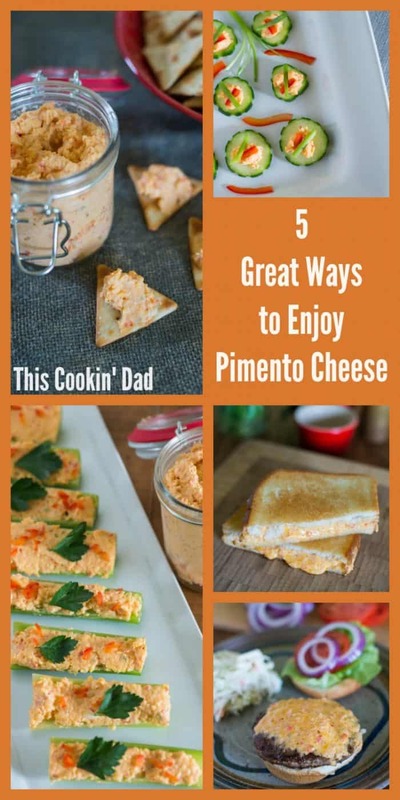 So, I have 5 great ways that you can use pimento cheese to feed a crowd or just for an easy meal at home. In the south, you grow up with certain staples. Grits, biscuits and gravy, chicken fried steak, red beans and rice, black-eyed peas, and sweet tea, just to name a few. 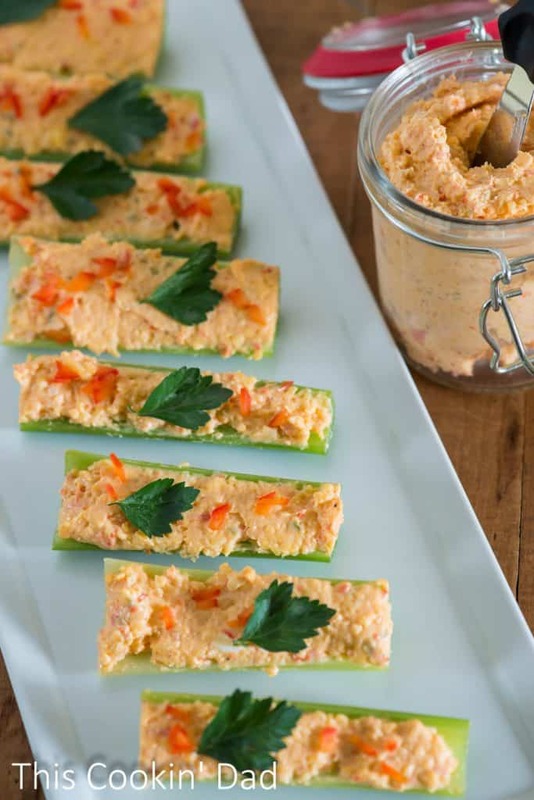 One absolute classic for parties, potlucks, and porches alike is pimento cheese. Cheese, mayo, peppers, and a little seasoning are the base, but recipes are all over the board, mostly passed along orally. It usually goes something like this. Here’s how I do it up. My recipe is a little different. 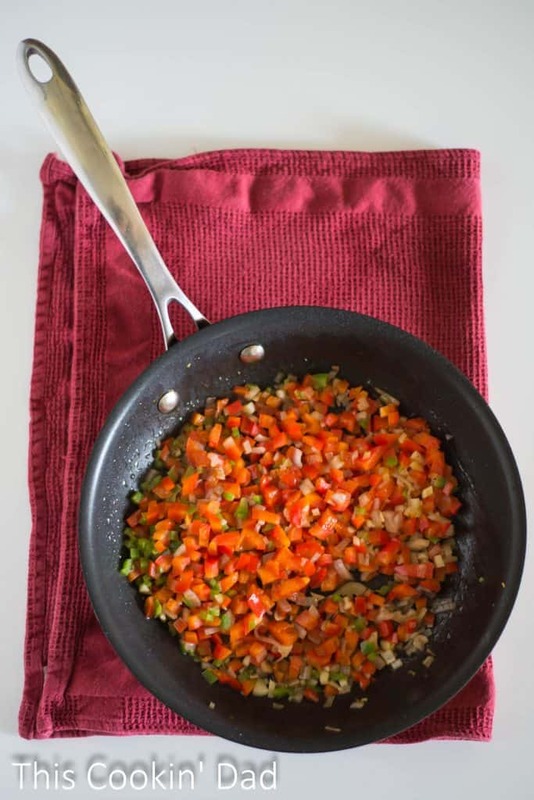 During the summer, that fresh produce is everywhere and just waiting to be used in recipes like this, so, over medium-high heat, I saute 1 cup diced red bell pepper, 1 diced jalapeno (keep the seeds and veins if you want it hotter), 1/2 cup of diced onion, and 2 cloves of minced garlic in 2 tsp olive oil for about5 minutes. Set aside to cool. You may never use those jarred pimento peppers, again!! 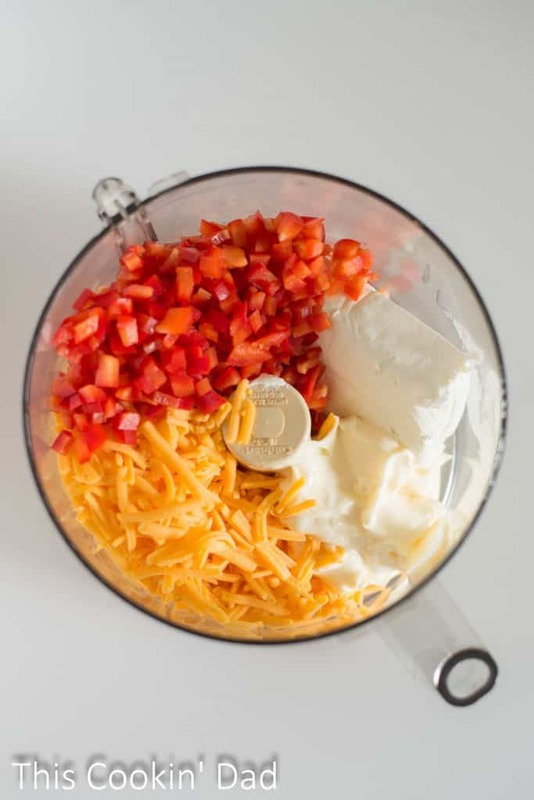 Next, I add 2 cups of shredded cheddar cheese, 1/2 cup of mayo, 8 oz of softened cream cheese (because I like my pimento cheese a little more spreadable), my cooled veggies, salt and pepper, and a few shakes of paprika to my food processor. I blend until it’s all incorporated, about 30 seconds to a minute, pour into containers and refrigerate for about 2 hours. This makes a pretty smooth spread that is perfect for just about any use. 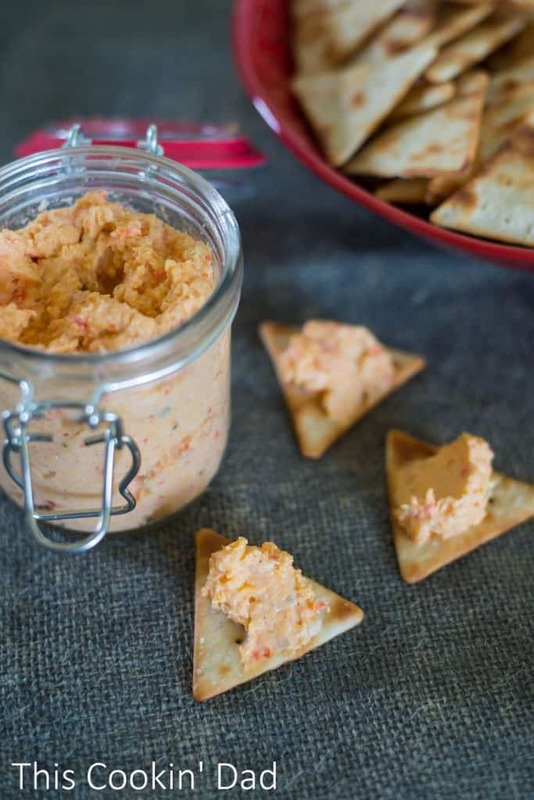 For me, pimento cheese is appropriate pretty much any time of day and for any occasion. I grew up eating it with butter crackers and nothing else, but, nowadays, there are so many great options, including my new fave, salty pita crackers. So my number 1 way to enjoy pimento cheese is simply out of a jar and spread onto a good salty cracker. 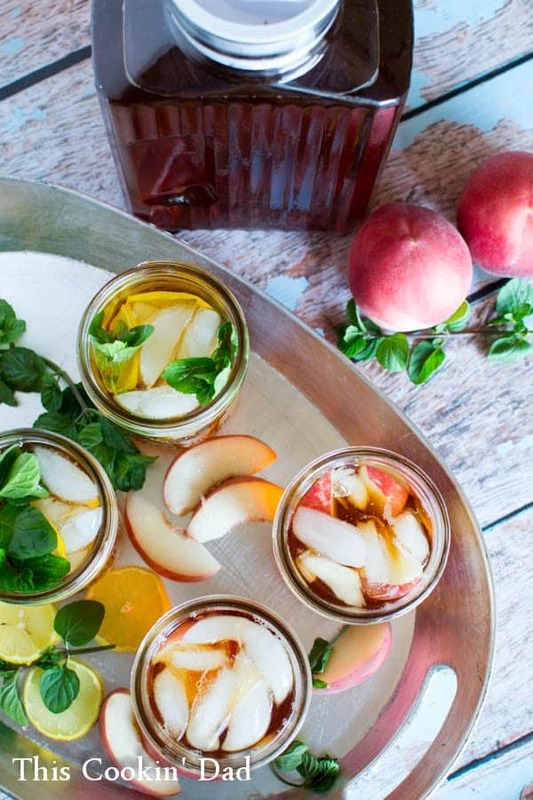 This is such a simple way to liven up afternoon snacks, potlucks, backyard BBQ’s, or just anytime that you need a little bite to eat. When I was growing up, my grandmother would make appetizer trays and spread that “Old English” cheddar in a jar stuff onto celery. I’m happy to say that I can upgrade that to freshly made pimento cheese spread into celery sticks and cut into easy serving sizes. Perfect for after school snacks or piling onto your plate at your next church potluck! 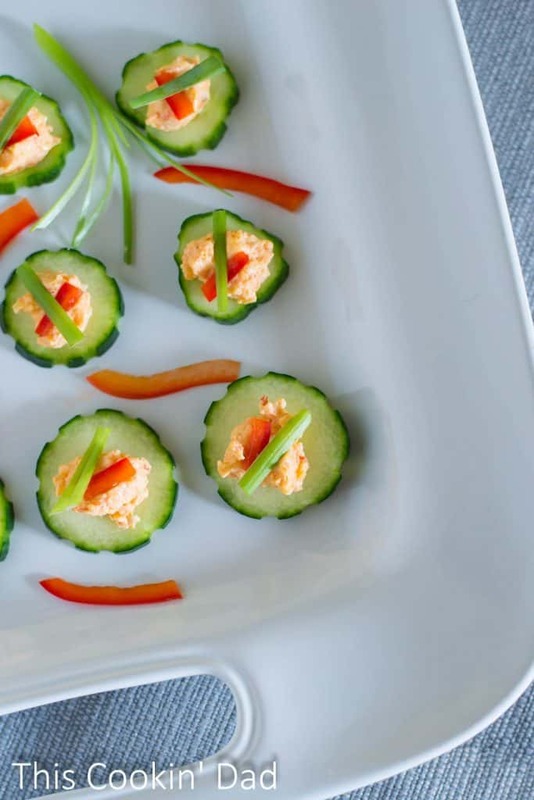 When I’m looking to fancy up your appetizers or do something more like a cocktail party, I just scoop a little bit of pimento cheese onto a cucumber round and top with fresh bell pepper and green onion for a modern take on southern classic. 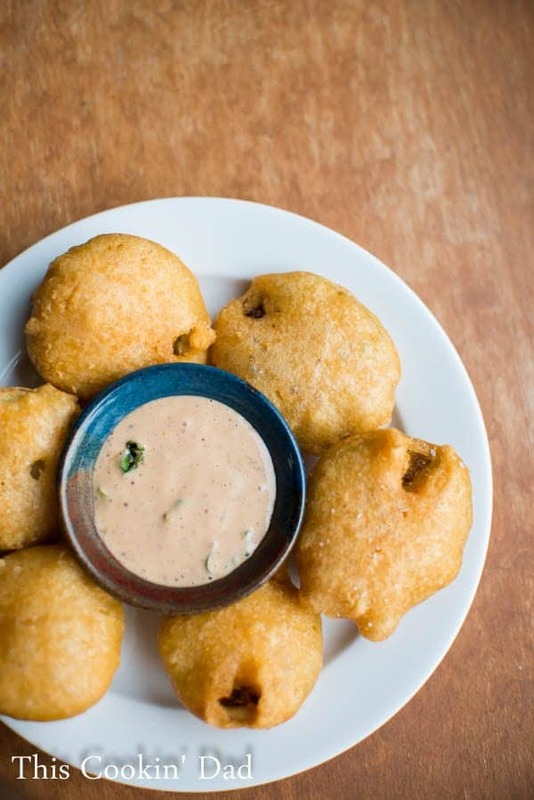 The bite is fresh and light, but you still get all of that beautiful, cheesy goodness! We’ve all seen those pimento cheese sandwich in the cooler section at the gas station, right? Any who doesn’t love a grilled cheese sandwich? I love both so much that I decided to combine them! 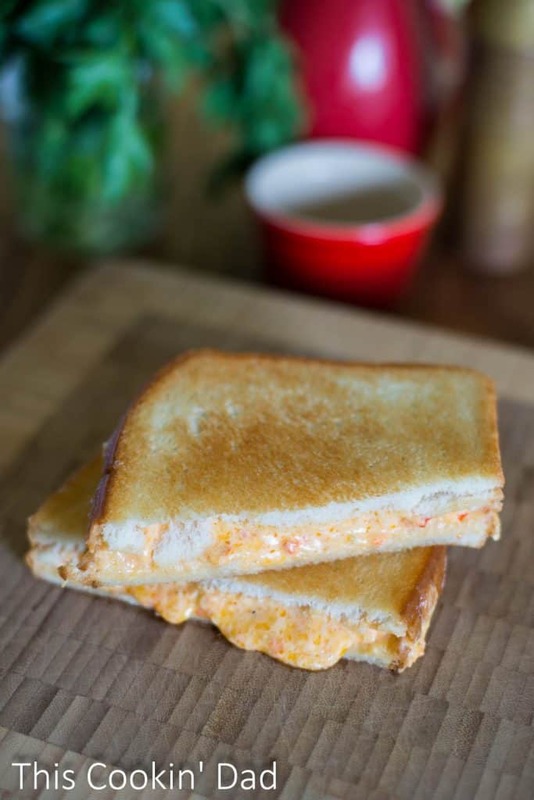 Instead of using that plastic wrapped slice of American cheese, I kick up my grilled cheese sandwich by spreading pimento cheese between two slices of white bread and toasting in lots of butter. YUM!! 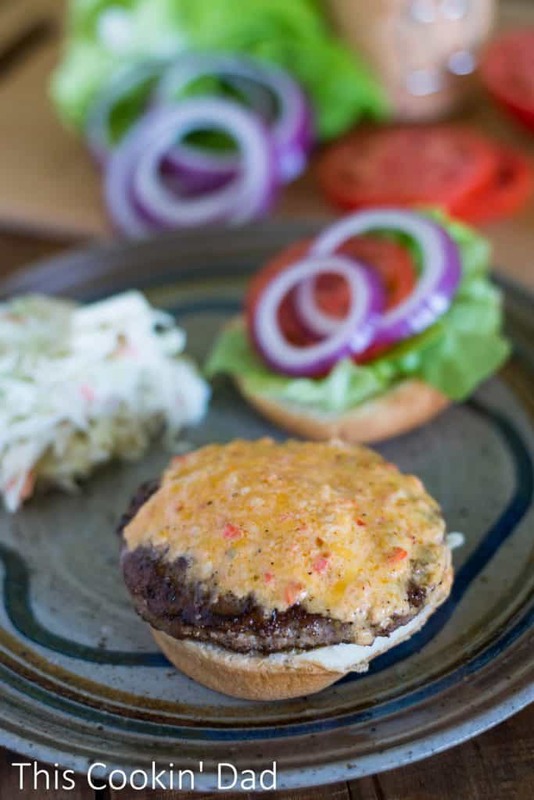 Last, but certainly not least, I take a simple cheeseburger to the next level by cooking it up on both sides and, during the last minute of cooking, adding a nice dollop of pimento cheese right on top. Close the grill or cover the pan so the cheese can melt and you may very well have one of the best things I’ve ever put on a hamburger bun! 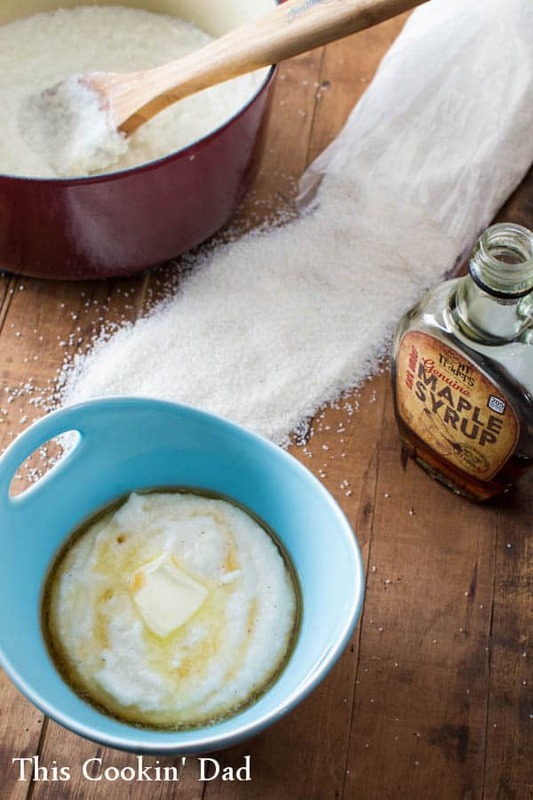 Any way you serve it, I’m sure that you family and friends will be asking you for your recipe. Feel free to share, but make sure you invite them over for it. It’s always more fun that way!! 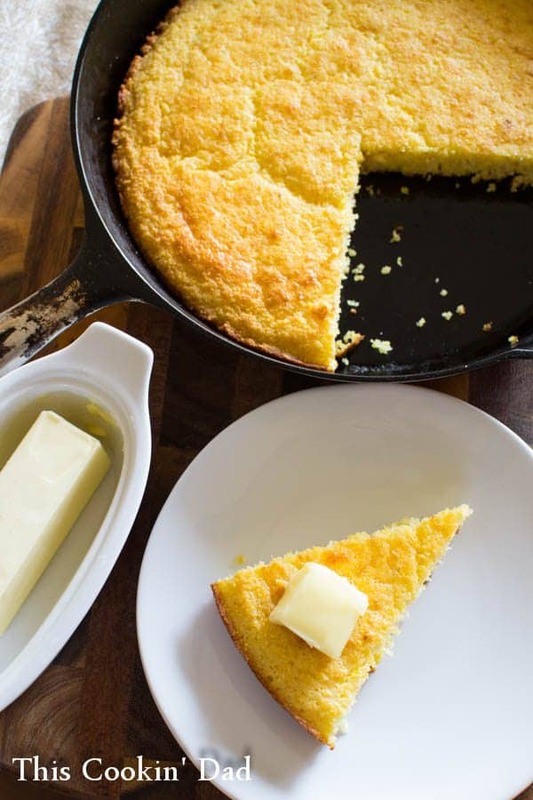 Looking for more classic southern recipes? Follow me on Twitter, Facebook, Pinterest, and Instagram, and make sure that you check out the recipes below!